This test is for finding whether the sugar is reducible or non reducible.It is both qualitative as well as quantitative test.This test is used for laboratory detection of different sugars as well as diabetes via urine test. When reducing sugars are heated in basic solution, they form powerful reducing compounds known as enedioles.Endiole further react with cupric ions which are present in Benedict’s solution to cuprous ions.Thus we detect the presence of reducing compounds.Here is should be noted that benedict’s solution not only react with reducing sugars but also give positive result with other reducing compounds. How to Check quality of Benedict’s solution? Before performing test it is necessary to test the purity of Benedict’s solution. Benedict’s solution is blue in color .In order to check purity of Benedict’s solution take 5 ml of Benedict’s solution in test tube and heat it.If is does not change color, it means it is pure. Take 5 ml of Benedict’s solution in a test tube. Add 5-8 drops of original solution in the test tube containing Benedict’s solution and heat it. Upon boiling, it will change the color.If it doesn’t change color, it means the sugar in the original solution is non reducible. Measure the Benedict’s solution solution first. Don’t add much solution. Add only few drops. Don’t keep the test tube towards any human while heating. Upon boiling it could escape test tube and burn skin. Biol it few times before making any decision. When can also determine the quantity of sugar in solution from Benedict’s test. If the co lour upon boiling is changed into green, then there would be 0.1 to 0.5 percent sugar in solution. This way we can find whether the sugar in solution is reducing sugar or not.And we can also determine the quantity as well up to some extent. If the solution changes its color to green, yellow, orange, red or brick red upon boiling, then it means that results are positive and the solution contains reducing sugar. If there is no color change upon boiling, then it means that NO reducing sugar is present in solution and result is negative. 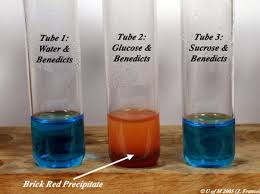 Sucrose doesn’t show positive results with Benedict’s reagent but if we reduce sucrose with the help of acid then its products would should positive results with Benedict’s solution. This way, we can confirm the reduction of sucrose as well. Why do we care about testing the reducing sugar content ? Whay is the purpose of the test? You will differentiate between reducing and non reducing sugars. After that you can perform other tests to find the exact sugar. Why is Na2CO3 added to the solution before the Benedict’s test is performed? why in benedict test, heating for more than 2 minutes is not carried out? i haven’t written anywhere in my post that you should not heat for more then 2 minutes. But 2 minutes are enough for reaction. probably for pH…but i will get back with more precise answer. why we add only 5-8 drops of reagent not more than it? because it is enough for the reaction. Could a positive Benedicts test occur without boiling if left for an extended period of time (72+hrs) at room temperature?